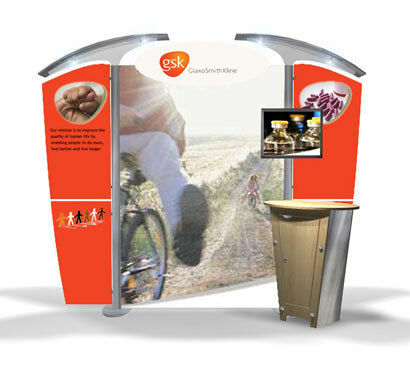 A portable 10'x 10' exhibit with 84H" x 58"W banner, locking backwall counter, bracket to support your video monitor and 2 bonded metal arc canopies. Countertops are available in either Natural Birch or Nevamar Silver/Alum MetalX laminate. Number of Cases: Packs in 3 - 48"x 25"x 9" rolling, rotomolded shipping cases. Each case weighs less than 100 lbs.